Over the past years, new forms of terrorism, war, and the clash of opposed cultural and religious value-systems have caused unprecedented mass migrations in the modern world. They have, in turn, brought about a fundamental level of insecurity among Western Cultures, a far-reaching irritation as to how to react properly to the streams of migrants risking their lives on dangerous passages – across land, sea and air borders – to seek refuge in the more prosperous and politically stable countries of the Western World. Those recent events demand a closer look into the history and nature of migration, its manifold causes, forms, and effects. Joint interdisciplinary efforts in thinking about migration as a cultural, political, and social phenomenon have never been more urgent than they are now. Only if we understand the literal migrations of people and objects across existing borders in both a larger cultural and a historical perspective, will we be able to broaden our understanding and perhaps re-evaluate the current political discussions on national security and the resulting societal discourses on inclusion vs. exclusion. This applies in particular for the overdue disentanglement of the categories of migration and terrorism, so easily juxtaposed with issues of (inter)-national stability and security. The Powerful Migrations conference is rooted in the realization that the obvious monopolization and linking of debates around migration and security in political and military discourse need be set on a broader intellectual footing – an endeavor that by necessity must be interdisciplinary. Within our framework, the concept of ‘fluidity’ will serve as a tentative paradigm to re-examining questions of migration, identity and security both in history and in recent times of globalization. The conference and all associated events are free and open to the public. 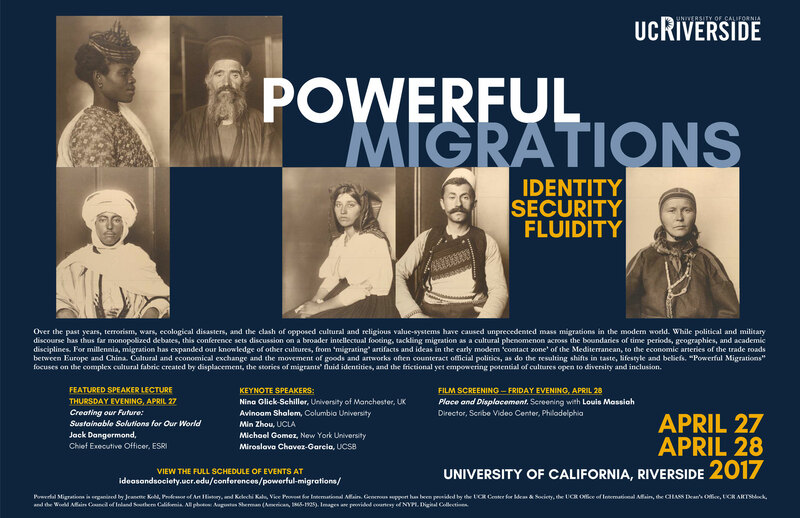 For questions or more information, email us at cisevents@ucr.edu or call 951-827-1556.